Drawn and Quarterly, 9781770461505, 416pp. 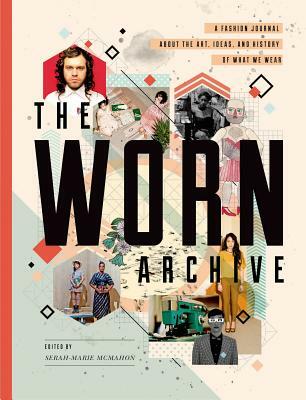 The WORN Archive: A Fashion Journal about the Arts, Ideas, and History of What We Wear is a manifesto on why fashion and clothing matter. For eight years, the Canadian magazine has investigated the intersections of fashion, pop culture, and art. With prescient, intelligent articles, WORN Fashion Journal strives to address diverse issues such as gender, identity, and culture with openness and honesty. WORN asserts that fashion is art, history, ideas, and most of all fun—that style is a personal experience that need not align with the fashion industry. The four-hundred-page book features the best content from the journal's first fourteen issues, assembled by WORN'S founder and editor in chief, Serah-Marie McMahon. Articles penned by a host of unique contributors (academics, writers, curators, and artists) touch on topics as wide-ranging as the relationship between feminism and fashion, discourse on hijabs, how to tie a tie, the history of flight attendants, and textile conservation. With eclectic photo shoots featuring "real" models, striking illustrations, and whimsical layouts, every page is a joyful, creative approach to clothing. The WORN Archive is the ultimate cultural style map for those who don't want to be told how to dress but are seeking a transformative understanding of why we wear what we do. Serah-Marie McMahon is the founder and editor in chief of WORN Fashion Journal and a freelance creative director. In 2010 she was nominated for a National Magazine Award for Best Cover of the Year.